So, it was inevitable, Lyft did wait for a couple of months this time, but they yet again followed Uber’s lead and changed their driver’s pay rates to mirror the changes that Uber recently made. Joe over at The Rideshare Guy recorded a video about the fare changes, so take a look at his video and scroll to the transcript below to see the points he covers. It’s no secret, Uber completely dictates pricing and driver rates in a rideshare. It’s a pattern. Uber will lower rates, then Lyft will lower rates. Uber will change to upfront pricing, then Lyft changes to upfront pricing. Uber will change our commissions from a percentage based commission to a rate based commission, Lyft will follow suit. Uber will alter our driver rates, our pay rates, and then Lyft will follow. But back in July, Uber lowered driver’s per mile rates, and increased driver’s per minute rates in five cities. The reasons given were to better value our time, and to make earnings more consistent and dependable. And just this month, Lyft did the exact same thing. For instance, here in Minneapolis, there is a 19% decrease in per mile rate, and a 63% increase in per minute rate. Will actual pay be affected by these rate changes? And not only are the rate changes exactly the same, but even the headlines for both announcements are almost the exact same as well. It makes you wonder if there’s any independent thought over at Lyft. And yet actual pay shouldn’t change much at all. Harry ran the numbers back in July when Uber made their changes, and he found that in any given week, you’re typically plus or minus $2 increase or decrease in earnings compared to the old rates. But earnings should be more consistent, you’re not going to get paid as much for those 20 minute, 19 mile rides, as you would with the old rates. But you are going to get paid more for those 20 minutes, 5 mile rides. Here’s a graph that Harry used for his article on Uber’s rate changes, and you can see that as the length of a trip increased, a driver would’ve been paid less with the new rates versus the shorter trips that would’ve paid him more. And this makes sense, since the mileage rate is decreasing, so long trips are not as valuable, and the time rate is increasing, so shorter trips are now more valuable. But as you can see, it pretty much all evens out in the need, since the difference in new versus old rates is negligible. And again, they did this so that earnings are more consistent and reliable, but drivers are pretty upset. Any time you see that a rate is decreased, any of your rates are decreased, as in the mileage rate, it’s decreased, it’s negative, it’s not a good look. It’s not something that you want to see. And I’m personally kind of indifferent on these changes, I mean the pay isn’t going to change a lot, we are getting paid more for our time, so we’re getting paid more when we’re in traffic, or when we make a stop for someone. But now when we get those ideal rides, those long rides like I said, where the mileage matches the time total, you’re not going to get paid as well. But, again, it should balance out with those shorter trips when you’re in traffic. And one thing you may want to do to take advantage of these rates are to drive slower. Drive the speed limit. The longer that your ride goes, the more you’re going to get paid, the better you’re going to get paid. And lastly, a quick bone to pick. Both announcements, both initial announcements by Uber and Lyft, at least here in Minneapolis and St Paul had mistakes in them. Uber had this graphic where they compared the old rates to the new rates, and in this example of a ride, they had someone going a distance of 20 miles in 12 minutes. You literally have to be going 100 miles an hour to get there in 12 minutes. You can see that they screwed up, they should have put 12 miles in 20 minutes, but it’s just an error, it’s annoying. And in Lyft’s initial announcement, you can see that there is a negative 19% there visually, you can see that, but then right below they say it’s going to be an increase by 19%. Whoever is compiling these announcements is creating a headache for drivers, and probably a headache for themselves. Just proof read these things before you send them out. It’s really annoying for drivers, and I can’t imagine how annoying it has to be for both Uber and Lyft to deal with all questions that are flooding in after they send out these announcements with mistakes. Let us know how the rate changes have affected you. Are you happy with them? Are your earnings more consistent, more reliable? 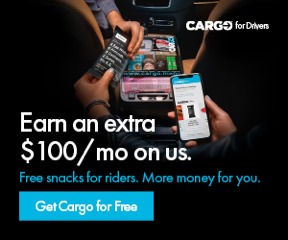 Are you happy with that, or did you prefer the old rates where some weeks you’d be getting paid a lot higher than other weeks, because you were getting a lot more longer rides? I you haven’t subscribed to the Rideshare Guy channel, please subscription. We post new videos every single week. Thanks again for watching, and drive safe. Thanks.